When NCG members come together, we engage both hearts and minds to rethink what’s possible. Our work at NCG affords us the extraordinary opportunity to have a lasting and meaningful impact in our region. 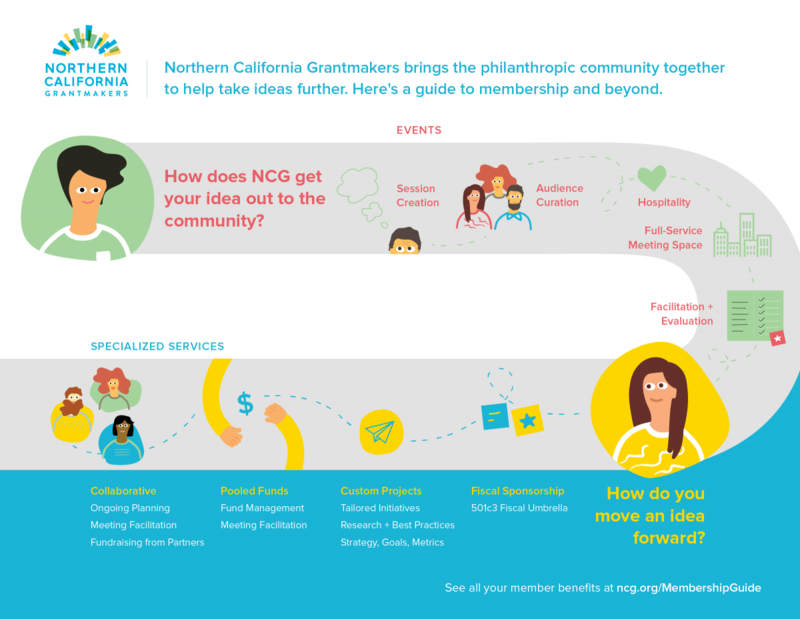 NCG’s membership is made up of grantmaking organizations, government agencies, philanthropic partner organizations and individual consultants, donor advisors and donors. We have nearly 200 organizations in our membership, representing $3 billion of funding in Northern California. Our membership brings deep expertise across a wide range of issues including health, education, arts, immigration, workforce, environment and much much more. Learn more about what you can do with your NCG membership below. Going beyond your membership, we also develop peer networks, working groups and collaboratives. These all take on different shapes and sizes, ranging from providing fiscal sponsorship, management of pooled funds, to custom projects and initiatives. The work is more specialized and targets a narrower segment of our membership. It also takes on more dedicated resources, support and funding from our members and partners. NCG staff work closely with members at a negotiated rate to deliver customized services that meet the unique objectives of our members. Agreements of this sort enable NCG to absorb the costs associated with these more intensive and sustained levels of support.